About Company: The business of energy never stands still. Since 1995, more than 2,000 energy industry customers have turned to OATI to provide solutions to their operational challenges. More than 1,100 dedicated staff members — with more combined energy industry experience than any other software solutions provider and one of the industry’s highest concentrations of PhDs — work with a single-minded focus to meet our customers’ changing commercial and technical needs. OATI is constantly innovating to help their customers make trading, moving, and delivering energy nearly effortless and extremely rewarding. Each innovative solution has been built to give customers easy access to mission-critical information, be seamlessly integrated across the energy industry, and designed to help users get more done. This is how OATI is transforming the business of energy together with our customers. For selected candidates, annual CTC will be Rs 2.5 lacs to Rs 3.20 lacs. Selected candidates will be required to sign 18 months’ service agreement with OATIndia. 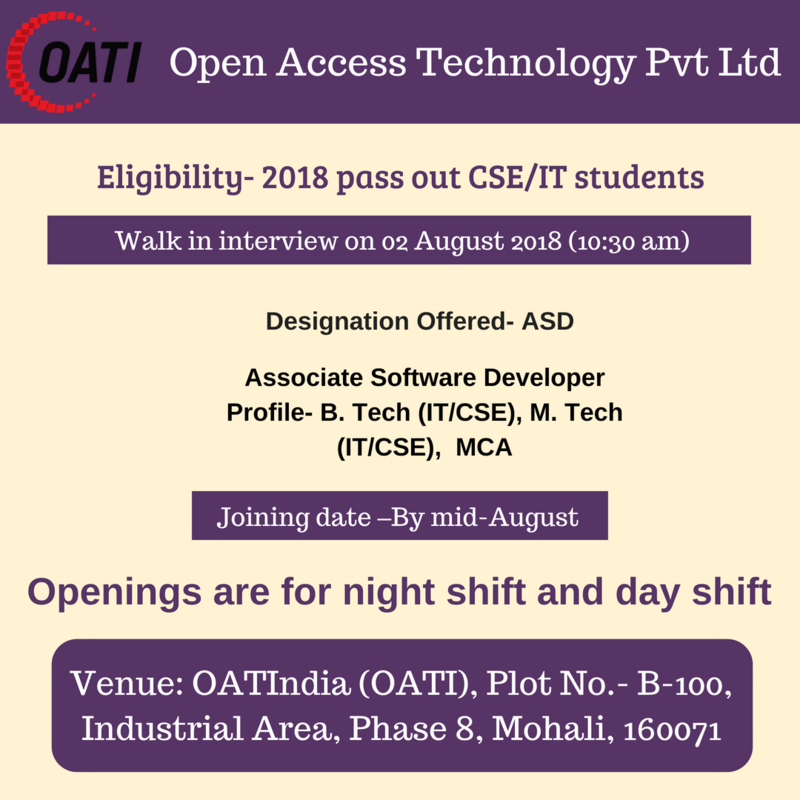 Only the candidates who are available for immediate joining and who would like to serve OATIndia should apply. JOB PURPOSE: Responsible for writing, coding and maintain individual programmes from specific requirements. Understand the product development lifecycle. Adhere and acquainted with procedure and policies on the day to day activity. Understanding the requirement, developing the solutions, testing and reporting the issues on time to the concerned persons. Identifying complex technical problems in a program and discussing them with Group Lead for an effective solution. Creating new forms and displays as per the need of customers. Maintenance of software codes/programs and modifications as per client requirement. Making changes to the software to resolve issues in already existing displays. Attending the team meetings and get the product knowledge and processes we follow. Report day to day activities to leads and get the feedback from them as well. Working as a Mentor of the new developers and guiding /helping them in their work. Responsible for peer testing to be done for every problem in India office before setting it on test for US office. Responsible for the following types of testing during the development and release cycle of products. Team Building: Contributes to team effort by accomplishing related results as needed.